A weekly newspaper has backed a bid to save a firm which trains engineering apprentices from closure. 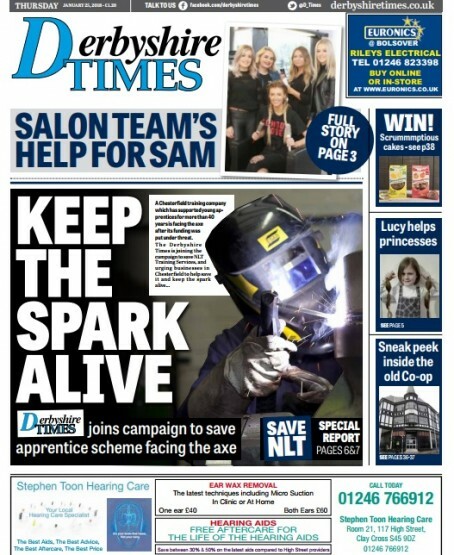 The Derbyshire Times is campaigning to keep NLT Training Services, which has trained apprentices since 1974, from shutting down. The firm is threatened with closure after having its funding withdrawn by the Education and Skills Funding Agency following a recent Ofsted inspection which led to it being rated ‘inadequate’. The Chesterfield-based company is asking other businesses to give their backing in a bid to re-secure funding. The Times, which is also based in the North Derbyshire town, splashed on the campaign’s launch last week. In a comment piece, editor Phil Bramley said: “Yes, other training providers may step in if it folded, but ensuring its continued survival is surely a better option – both for local young engineers – and the staff that would lose their jobs if it disappeared. “More options, more choices for our children and grandchildren are vital if everyone is to find their place in the world. I’ve seen at first hand the work NLT does; what it can offer. Phil told HTFP: “We splashed on the story and our campaign to help try and save NLT as we feel it would be a huge blow for the area’s young people if it closed. “As I mentioned in the editorial, Chesterfield has a long tradition of engineering heritage and NLT has helped train engineering apprentices here since 1974.